This might be the most beautiful themed wedding we’ve ever seen. It isn’t just pulling at our heart strings — it’s yanking out feelings of whimsy and magic. The detail (the grandfather is dressed as Peter Falk and officiating). That DRESS! 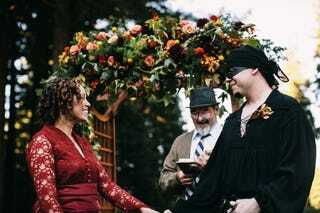 This is the most amazing Princess Bride wedding, nay cosplay wedding we’ve seen in ages. Well done. To see more images of the Princess Bride wedding (including a great shot of that gorgeous dress) head over to Offbeat Bride.